Carol Whitehair, Home Health and Hospice of Dickinson County Director and Kansas Home Care and Hospice Association Board Chairman, recently attended the Forum of States Meeting in Washington, D.C., in conjunction with the National Association of Home Care and Hospice “March on Washington”. She was accompanied by Kansas Home Care and Hospice Association Executive Director Jane Kelly. Whitehair and Kelly visited the Kansas Congressional Offices to discuss recent Medicare changes and to advocate for Home Care and Hospice. 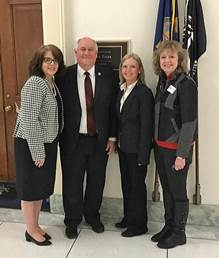 Pictured at left, from right to left, are Kelly, Whitehair, Kansas Congressman Ron Estes, and Estes’ wife Susan.